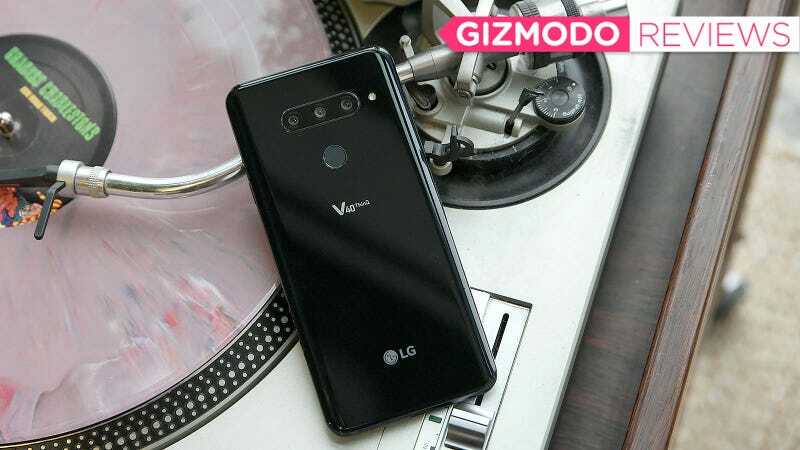 If the new LG V40 was a person, it would almost certainly be an AV nerd. On the outside, it’s dressed in a rather drab, but not offensive outfit. Inside, it’s got some serious camera talent. By building on the success of the Huawei P20 Pro, LG’s latest flagship has upped the number of cameras you can cram into a single phone from four to five, with a dual 8-MP/5-MP selfie cam setup in front, and a trio of cameras in the back. It’s kind of funny because it seems like just yesterday, people were balking at phones with dual rear cams since they went mainstream on phones like the LG G5, Huawei P9 and iPhone 7 Plus. But in the space of a year the speed of innovation has really picked up, and with devices like Nokia’s rumored penta-cam device potentially coming soon, we’re basically living through a camera stacking arms race, and I’m all about it. Thanks to all this camera trickery, the V40 delivers one of the most well-rounded audiovisual toolkits on the market. Do you want depth of field effects on both sides of the phone? You got it. How about three different fields of view for capturing all sorts of scenes? No problem. Maybe even a tool to make your own cinemagraphs? The V40 has that too. And to make sure all of the V40’s lenses play nicely with each other, LG even tinkered with its camera software to ensure you don’t forget how useful all that glass is, and maybe even teach you how to use them a little better. In back, those three digital eyes include a 12-MP f/1.5 main cam, a 16-MP f/1.9 super wide-angle cam, and a 12-MP f/2.4 telephoto cam with a 2x zoom. That means there’s a lens for almost every situation, and they are all quite sharp. In a head-to-head shootout against a Galaxy Note 9, which is LG’s biggest rival in terms of price, features, and hometown bragging rights, the V40’s shot of a bowl of beef noodle soup was just as good, if not a tiny bit better than what the Samsung captured. (You can see all these image comparisons in a gallery below.) There are minor differences in color, which is to be expected from phones made by different companies, and if you zoom in to pixel peep, the V40’s shot actually looks a little sharper and features better details on the meat. From left to right, the 12-MP 2x zoom cam, the 107 degree 16-MP super wide-angle cam, and the 12-MP main cam. Next, when I tested out the V40’s new 2x zoom at a recent CS:Go tournament, while the Note 9’s shot did a better cutting down the scene’s excessive blue color cast, the V40 wasn’t far off. And when I snapped a quick pic of a happy little turtle, the V40 was once again quite close, featuring detailed textures on the rock and reptile, though the V40’s shot overall does appear slightly overexposed. Here’s a wide angle shot from the V40, which let me capture the Flatiron building in a way i couldn’t really do using the Note 9 due to tourists and other obstructions. Finally, in low-light, the V40 once again kept up with the Note 9. However, if you look zoom in close and look at the candle and the silverware, you can see where the Note 9 has a small advantage in detail and noise reduction. To be clear, while I think the Note 9 offers just a little more when it comes to image quality, the V40 ain’t no slouch either. I didn’t notice the people walking in the background until it was too late, which ruins the effect a bit. And strangely, if you download Cine Shots from the phone, they are movie files not GIFs, so you may need to convert them yourself. But we’re not done yet, because there’s still the V40’s super wide-angle camera to consider—something the Note 9 doesn’t even have—which lets you capture expansive view of buildings or sports events that you might otherwise miss. 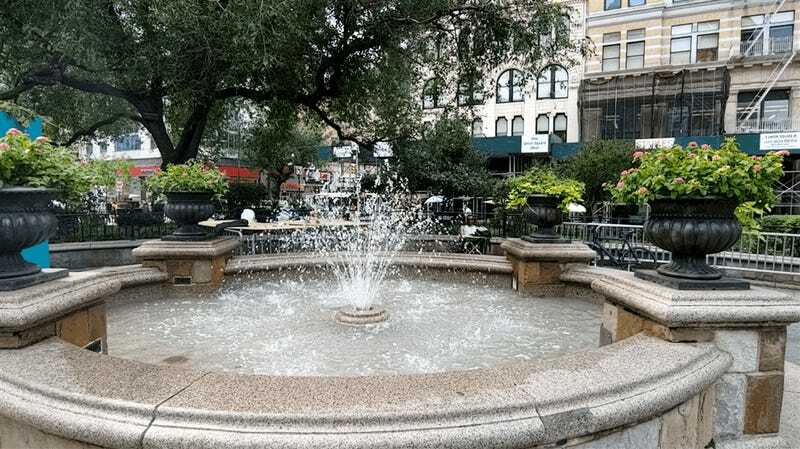 And then there’s the tweaking LG has done to the V40’s camera app. Now, if you want to get a preview of what each lens is seeing, you can just long-press on the three icons at the top of the screen to get a live view of each camera’s field of view. And if you still can’t decide which lens is best from that, you can simply turn on Triple Shot and have the V40 take a picture with all three lenses in a (somewhat) quick succession. Unfortunately, because you can’t really pick your focus area in triple shot like you can normally, the feature is mostly best used as a guide to help compose more pics later. If anything, I wish LG had made the live previews bigger so that it’s easier to get a sense of a pic’s composition. There’s also the V40’s new Cine Shot mode, which lets you turn videos into endlessly looping movie, or what aficionados tend to call cinemagraphs. All you have to do is take a quick three-second video, highlight the specific section of the scene you want to keep in motion by painting over it with your finger, and that’s it, you’re done. Sometimes, there are issues where the motion looks jumpy or the gif doesn’t loop perfectly, but even so, turning the process of making your own cinemagraphs from sometimes that could take multiple hours into one that takes less than 15 seconds is a lot of fun. That said, I do wish there were a few more options in Cine Shot like being able to set the video capture to something longer than three seconds. Like this, it’s harder to tell the V40 has a notch, but it’s there. And on top of all the new stuff, there’s still all of LG’s previous camera features to consider, like its AI Cam mode that can recognize various objects and scene and then use that info to automatically adjust picture settings, a new version of Google Lens that works in real-time instead of requiring you snap a picture first, and fancy tricks like LG’s Cine Video that lets you smoothly zoom onto a specific subject like real videographer. USB-C and a headphone jack, gasp! Cameras aside, the V40’s general specs are pretty solid too. It comes with a Qualcomm Snapdragon 845 processor, 6GB of RAM, 64GB of storage, a microSD card slot, water resistance, wireless charging, and a fingerprint sensor. It even has a headphone jack— something you only seem to find on budget devices and phones from South Korea nowadays—which works in tandem with a built-in 32-bit quad DAC to deliver some seriously nice sounding wired audio. I typically don’t talk to the Google Assistant in public, so that button doesn’t do much for me. But to each their own. The V40’s big 6.4-inch OLED display is also quite bright (it hit 598 nits on our equipment, higher than both the Note 9 and iPhone XS), and doesn’t show any weird tinting or banding that we’ve seen on some of LG’s previous screens. And despite having an average-sized 3,300 mAh battery, the V40 did just fine on our rundown test with a time 10 hours and 42 minutes. Sure, that’s noticeably shorter than an iPhone XS Max (13:07) or a Note 9 (14:11), but its only half an hour shy of a standard iPhone XS (11:11). However, what isn’t so nice is that out of the box, the V40 features Android 8.1 instead of Android 9, and LG isn’t saying when an update might arrive. LG is also weirdly trying to push how thin and light the V40 is compared some other big name phones. I thought we were past this. At 5.96 ounces, the V40 does weigh about an ounce less than phones with similar size displays, but I’m kind of struggling to care. I’ve never thought once that a phone is too heavy to use, but maybe that’s just me. LG calls that gray area the V40's second screen, but we all know what it really is. Meanwhile, the V40’s design is quite plain, sporting the same glass sandwich design found on every handset made in the last 18 months. LG even avoided turning the V40’s notch into a little face by positioning the two selfie cams next to each other instead of putting the earpiece in the middle. It’s like LG was trying to avoid giving this phone a personality of any kind. As for the notch itself, LG’s default UI does a good job of blurring the line between the cutout and screen, but if you don’t mind showing off the notch there are some fun multi-colored borders you can use instead. 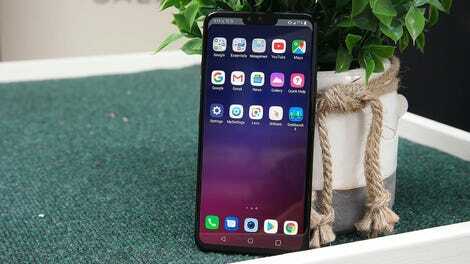 The V40 also retains the dedicated Google Assistant button LG debuted on the G7, though after using it again six months later, I still question how useful it really is. My biggest issue with the V40, though, is its price. Listed at around $950 (depending on where you buy it), it feels like LG may have set its sights a bit too high. Yes, all those cameras are cool and each one has its use, and its specs are fine for a flagship, but when it comes to making its price feel justified, I think the V40 falls a little short. Give me another 2GB of RAM, more built-in storage, or hell, even a stylus, because even though it has more cameras than a $1,000 Galaxy Note 9, Samsung’s big, expensive handset feels like a better value. And for this much money, a premium handset absolutely needs to look as cool as all the tech it has stuffed inside. Sadly, the V40 doesn’t quite get there either. But if you don’t mind trying to find a way to get a sweeter deal, like waiting a few months for the price to drop, or opting for the V40’s surprisingly good pre-order bundle which includes a free DJI Osmo Mobile 2 and a 256GB microSD card, the payoff could be worth it. For all the people who say the most important thing about their next phone is getting a better camera, between the V40’s five cameras and all of its nifty camera tricks, LG’s latest phone has that covered. And if you don’t go for the V40, just know that LG’s multi-cam madness will probably be coming soon to every other high-end handset too. Featuring a main 12-MP camera, a super wide-angle 16-MP cam, a 12-MP cam with a 2x zoom and a bunch of nifty software tricks, the V40 has one of the most versatile photo and video toolkits you can get on a phone. Aside from the V40’s five cameras, there isn’t really anything interesting going on with the phone’s design, which is kind of a bummer. The V40 will sadly have Android 8.1 installed out of the box, not Android 9, and LG’s skin is largely unchanged from previous devices, which leaves it feeling less customizable than Samsung’s skin, and also not quite as slick as stock Android. At 10 hours and 42 minutes, the V40’s battery life is solid, and you get a fairly full-featured assortment of ports and specs including USB-C, wireless charging, IP68 water-resistance, wireless charging, and a headphone jack(! ).